Today we’re going to explore Cannaregio, on the north western side of the city. If you like, you could start the day early by peeking inside the Gesuiti. This Jesuit church is located in a part of the city that you’re unlikely to idly wander past, and I’d never seen it until my last visit to Venice in October 2013. It’s interior is as stupendous as its extravagant Baroque exterior – columns of green and white marble carved to resemble immense folds of damask. Apparently, there is painting of the Martyrdom of St Lawrence by Titian – I’m sorry to say that I was so gobsmacked by the interior that I have no recollection of the painting. 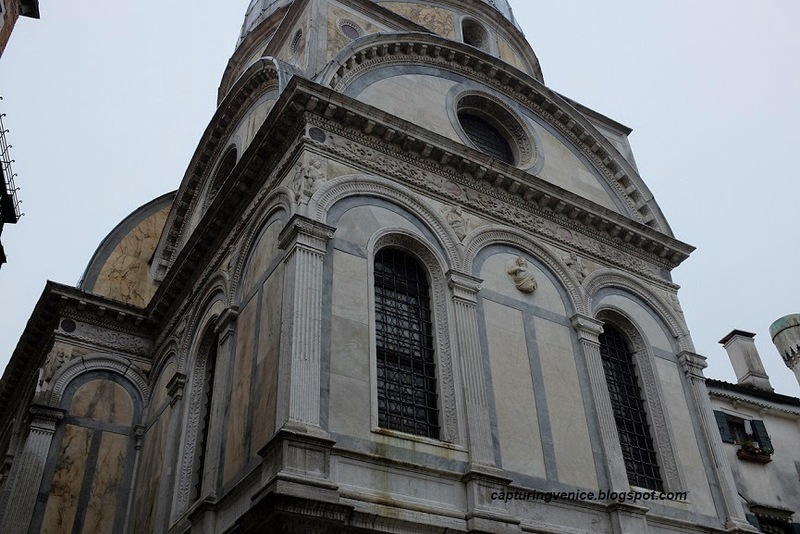 To get to the main sights of the day, walk back to Fondamente Nuove to catch a vaporetto to Madonna dell’Orto. Cima da Conegliano’s St John the Baptist and other saints and the sad sight of the vacant space that used to be occupied by Bellini’s Madonna with child, which was stolen in 1993. Campo dei Mori is named after three Mastelli brothers who were silk merchants who came from Peloponnese in 1112 and built the Palazzo Mastelli. The three stone figures (including one with a large urban) are believed to be modelled on these three brothers. In the 19th century, a stone figure with a rusty nose was added. He is nicknamed ‘Signor Antonio Rioba. Your next trek is to the Campo del Ghetto Nuovo, the nucleus of the Ghetto. In 1516, the Venetian government decreed that all Jews in Venice be confined the little island. They could leave by day (but only if they wore an identifying badge and cap) and the only trades that they could pursue were money-lending, textiles and medicine. At night, the gates were locked and patrolled by Christian watchmen (whose wages of course, were levied from the Jewish community) – you can still see the marks left by the hinges of the gates in the Sottoportego Ghetto Nuovo. Not only were the Jews confined to this area of Venice, but their buildings were to be no more than one-third higher than in the rest of Venice. The growing numbers of Jewish citizens and limited space the buildings contain many floors, each with ceilings as low as possible in order to fit as many families as possible. The Campo del Ghetto Nuovo with its multi-storeyed buildings with low ceilings looks very different to the rest of the city. In 1541, the community expanded into the Ghetto Vecchio and again in 1633 into the Ghetto Nuovissimo. Napoleon pulled down the gates of the Ghetto in 1797, but the Austrians put them up again, and the Jewish community was allowed free access to the city only in 1866 when Venice became part of the Kingdom of Italy. Each wave of Jewish immigrants who came to Venice established their own synagogues and I recommend that you take a tour of the tour of the Museo Ebraico (note that it’s closed on Saturday) which will also give you the opportunity to view some of these synagogues: the Scola Tedesca (German) founded in 1528, the Scola Levantina (Levantine) founded in 1538, the Scola Spagnola (Spanish) founded in the 16th century and the Scola Italiana founded in 1575. The memorial to the 200 Venetian Jews who were deported to death camps in 1943 and 1944 is sombre and poignant. And so it’s coming to an end, and I hope that you’ve had a chance to understand the richness of Venice visually, culturally and historically. I always tell my husband that I’ll spend my lifetime dreaming and visiting Venice and still, I don’t think I’ll ever know it as well as I would wish. There is still so much that I haven’t yet had the chance to experience or begin to understand. I can’t be prescriptive about your final few hours in Venice. There may be things that you’re desperate to see that I haven’t covered, there may be things you’d like to do and see again, you may wish simply to wander aimlessly, looking, exploring and learning as you go. And you may even just wish to simply sit and look and enjoy the city holding a glass of wine or an apertivo in your hand. I leave it to you. The Miracoli is a jewel box both inside and out. 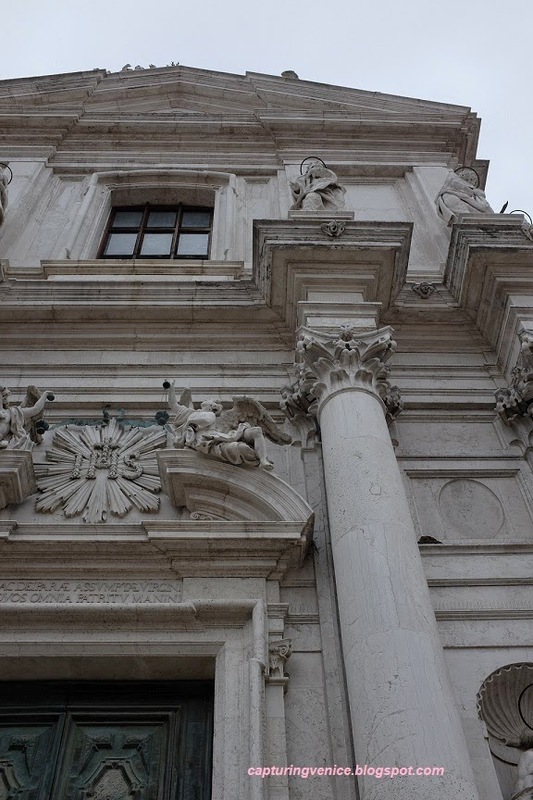 A Renaissance building, its facade is covered in marble and sculptures and its interior is equally delicate and ethereal, with soft pink, white and grey marbles. Marco Polo and his family lived near San Giovanni Grisostomo in Corte Prima del Milion and Corte Seconda del Milion. When Marco Polo returned from the East, bearing a fortune in jewels, he was nicknamed ‘Mr Millions’, hence the somewhat mocking name for the area in which his family lived. Formerly the home of Spanish fashion designer and artist, Mariano Fortuny, Museo Fortuny hosts special exhibitions as well as permanent displays of Fortuny’s own collection and some of his pleated silk dresses that were fashionable in the early 20th century. This is a museum of fabrics and costumes housed in the Gothic-style Palazzo Mocenigo. It was bequeathed to the city by a Mocenigo descendant in 1945, and it contains costumes from the Museo Correr, Guggenheim and Cini collections. This fabulous building was the last palazzo to be built on the Grand Canal in the 1730s, and hosts equally fabulous exhibitiond of contemporary art. Like the Punta della Dogana, it is owned by Francois Pinault. My ‘ideal’ week of Venice for the first time visitor. I’m keen to hear from you – what have I missed? If you were to bring your favourite person to Venice for the first time, what would you show them?